One person was killed in a crash and vehicle fire on Interstate 20 in Arlington Monday morning, police say. 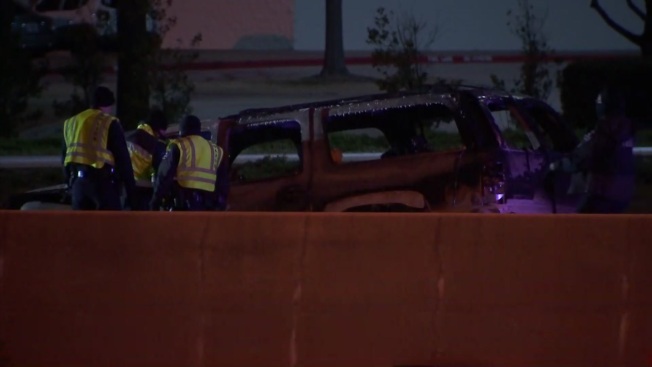 Arlington police were called about 3:15 a.m. to the 1300 block of I-20 where a SUV crashed into a barrier wall and caught fire, police said. The driver was pronounced dead at the scene, police said. No others were in the vehicle. The westbound lanes of I-20 were closed at Matlock Road while crews worked to clear the scene. All lanes were reopened shortly after 7:30 a.m.
Arlington police ask anyone who may have witnessed the crash to contact Traffic Investigator David Szatkowski at 817-459-5786.